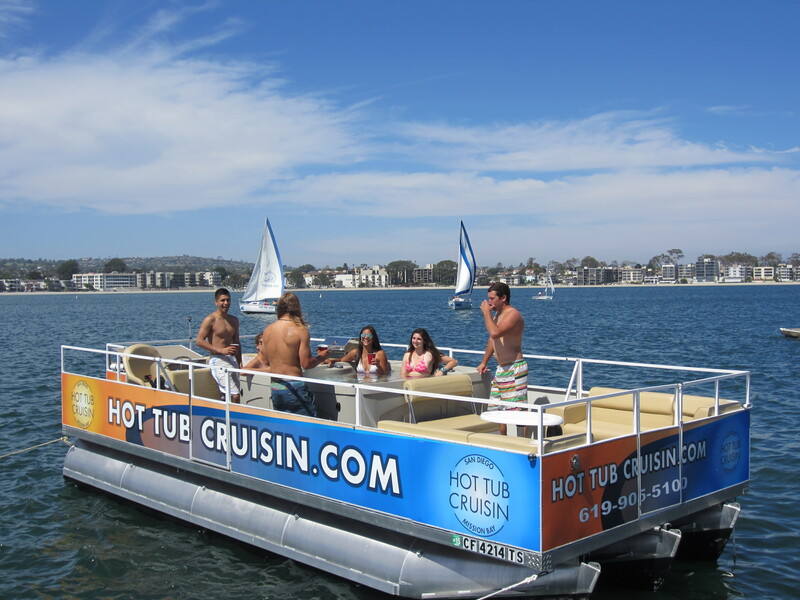 SAN DIEGO – If you’re looking to get out on the water but don’t feel like taking the helm, San Diego Hot Tub Cruisin offers guests a new way to see Mission Bay. The new boating adventure provides up to eight guests the opportunity to take in scenic views while lounging in a multi-jet hot tub – that floats. Created by brothers, Taylor and Zac Rhodes, the idea was to merge hot tubs with water skiing and wake boarding. They researched the requirements that would allow the boat to hold the hot tub, people and many other important elements required to pass Coast Guard and lifeguard requirements. The first boat was produced in March 2014. They had the pontoons and decking custom made, assembled the custom fabricated pontoons, put down the decking, assembled the seating and carpet, and installed the hot tub. Measuring 10 feet in width and 26 feet in length, the boat can seat 10 people, eight in the hot tub. There are three additional seating areas on board, complete with a propane barbeque, sound system, swim ladder, a table and a cooler. Groups take the boat out by themselves after completing a comprehensive tutorial by staff. The driver must be at least 18 years of age and have a valid driver’s license. Drinking is allowed as long as there is a sober driver. Some groups head out into Sail Bay while others prefer nighttime cruises to catch the nightly Seaworld fireworks show. Relax in the hot tub or take a seat on the plush deck seating. With adjustable water temperatures, passengers can enjoy a refreshing dip in the hot tub or turn up the heat to stay warm on a cooler day – all while being out on the water. Hot Tub Crusin operates out of Mission Bay Sportcenter in Mission Bay. For more information, visit hottubcruisin.com or call (619)905-5100.